Aye aye, Captain Stubing. How are Gopher and Doc? Permission to come aboard, sir! Happy 4th of July!! 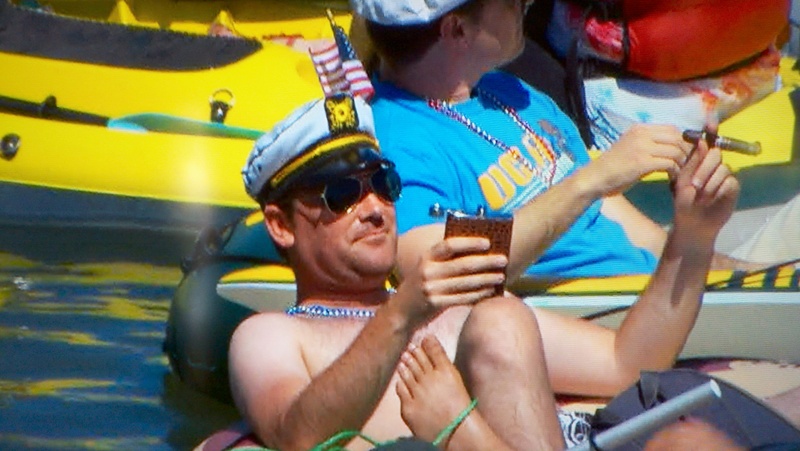 Snapped a screenshot of this cat out in McCovey Cove during the Padres vs. Giants game in San Francisco. I hate the Giants, so devoting a post to the amazingness of this guy…is difficult for me. However, he may be the greatest baseball fan in the history of Independence Day. Flask? Check. Cigar? Check. Farmer’s tan? Check. Mardi Gras beads? Check. Aviators? Check. Captain’s cap? Check. American Flag lodged in your captain’s cap? Check. I wanna party with you, Skipper. This entry was posted in Baseball, MLB and tagged 4th of July, Giants, Independence Day, Major League Baseball, McCovey Cove, MLB, Padres, San Diego, San Diego Padres, San Francisco Giants. Bookmark the permalink.